the volume, I can be to you in two hours or less. Welcome toKennedy Notary Services, serving all ofLos Angeles County, and parts of Orange County and Ventura County. Our mission is to support mortgage loan professionals, escrow officers, attorneys, auto dealers, their clients and customers, and other individuals needing prompt, efficient, and reliable notary services. I have been helping people sign important documents of all kinds for more than twelve years. And any other document you need notarized. I know from experience the questions and concerns signers have for these types of documents and I can address those directly in the signing session. 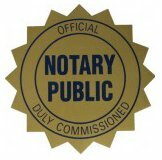 For the occasional tougher question I know how and when to involve the loan officer, attorney, or other professional for whom I am providing the notary service. For further information or to set up a signing, call me on the mobile phone: 818-919-4569, or send me a message through the Contact page. I look forward to doing business with you!